Call for our latest inventory! Not your typical pawnshop, WizeBuys PawnBrokers Outlet in Highland is more than just a place to sell and buy merchandise (new and pre-owned). Established in 2009, WizeBuys PawnBrokers Outlet’s inventory has everything from fine jewelry to sporting goods to firearms. What makes us stand out in the pawnshop business is our commitment to our patrons. We make sure that every piece of sports equipment, jewelry, every musical instrument and electronic equipment is in standard working order and excellent condition. What this means is that we personally test all our goods before purchase and again resale. This ensures that any item or piece of merchandise we are selling meets its future user’s expectations. We also understand that things happen in all our lives that require money fast. That’s why we are here to help; our employees strive to provide each and every customer with the best pawnshop experience possible. We purchase your merchandise (old, new or used) at higher prices than our competitors so you have more money in your pocket. Furthermore, we resell items at a discounted price. Our electronic inventory includes desktop computers, DVD players, video games, stereo equipment, TVs, and the latest apple products (IPads, IPhones and IPods), electric guitars, amps and more. Not to be out done, our sporting goods and firearm selection are the best money can afford. We also have a large and rare selection of latest styles of jewelry, top of the line watches and wedding rings – all at affordable prices. Lastly, we do more than buy and sell. WizeBuys PawnBrokers Outlet provides standard same day Cash loans with a 90-day recoupment period. We are a great choice for collateral Cash loans, cash for gold and when it comes to all your immediate cash needs. We offer 3-month collateral Cash loans with a low interest rate of 3% secured against jewelry. 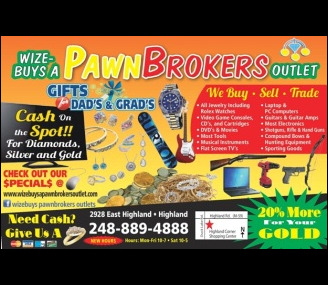 So come on in to WizeBuys PawnBrokers Outlet in Highland. Whether you’re looking to buy, sell or need cash for gold, come see for yourself what we have to offer.